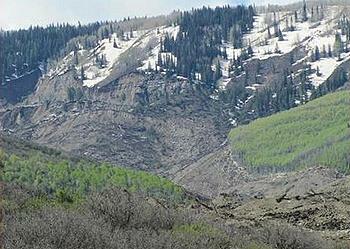 MESA COUNTY, Colorado, May 28, 2014 (ENS) – Colorado emergency authorities have called off a search for three men missing after an enormous mudslide in a remote part of western Colorado. Mesa County Sheriff Stan Hilkey said Tuesday that another slide could come down the mountainside, which is too unstable to continue the search. A unified incident command was established Sunday between Plateau Valley Fire Department, Mesa County Road and Bridge, and the Mesa County Sheriff’s Office, to handle the large mudslide incident and search for the three missing men. The first reports of the mudslide came into the Grand Junction Regional Communication Center about 6:15 pm on Saturday, along with reports of three local Collbran/Mesa area ranchers missing. Plateau Valley Fire Department first responded to the area of Salt Creek Road, in the area of Vega Reservoir, on the Grand Mesa. This area is east and south of the small town of Collbran, about 11 miles, located in Mesa County. The mudslide is estimated to be about four miles long, two miles wide and about 250 feet deep, in many places. It is described as very unstable by deputies on scene, and they estimate an entire ridge has been sliding for most of Sunday. A witness who called into dispatch Sunday evening, described hearing a noise from the slide that sounded much like a freight train. “This slide is unbelievably big,” Lt. Phil Stratton, Mesa County Sheriff’s Office, said. Weather, including rain, has fallen in Mesa County most of Saturday and likely contributed to the cause of the slide. The area is very remote and no structures have been reported damaged, however a more accurate assessment will be established after daylight tomorrow. No major roads have been impacted (I-70 is approximately 26 miles north of the slide). Cell phone service does not work in the area. Media and citizens are highly discouraged from going up there for safety reasons and will not be allowed through the roadblock that has been established outside the mudslide perimeter. The roadblock is set up at the intersection of Highway 330 and Salt Creek Road, outside the town of Collbran. WASHINGTON, DC, May 27, 2014 (ENS) – The U.S. Environmental Protection Agency has finalized standards to protect billions of fish and other aquatic creatures drawn each year into cooling water systems at large power plants and factories. This final rule is required by the Clean Water Act to address site-specific challenges, and establishes a common sense framework, putting a premium on public input and flexibility for facilities to comply. An estimated 2.1 billion fish, crabs, and shrimp are killed annually by being pinned against cooling water intake structures (impingement) or being drawn into cooling water systems and affected by heat, chemicals, or physical stress (entrainment). To protect threatened and endangered species and critical habitat, the expertise of the Fish & Wildlife Service and National Marine Fisheries Service is available to inform decisions about control technologies at individual facilities. “EPA is making it clear that if you have cooling water intakes you have to look at the impact on aquatic life in local waterways and take steps to minimize that impact,” said Nancy Stoner, acting assistant administrator for water at EPA. The final rule establishes requirements under the Clean Water Act for all existing power generating facilities and existing manufacturing and industrial facilities that withdraw more than two million gallons per day of water from waters of the U.S. and use at least 25 percent of the water they withdraw exclusively for cooling purposes. This rule covers roughly 1,065 existing facilities – 521 of these facilities are factories, and the other 544 are power plants. The technologies required under the rule are well understood, have been in use for several decades, and are in use at over 40 percent of facilities. Closed cycle systems are the most effective at reducing entrainment. This can be done by incorporating a closed-cycle system into the design of the new unit, or by making other design changes equivalent to the reductions associated with closed-cycle cooling. The national requirements, which will be implemented through National Pollutant Discharge Elimination System (NPDES) permits, are applicable to the location, design, construction, and capacity of cooling water intake structures at these facilities and are based on the best technology available for minimizing environmental impact. The rule establishes a strong baseline level of protection and then allows additional safeguards for aquatic life to be developed through site-specific analysis, an approach that ensures the best technology available is used. It puts implementation analysis in the hands of the permit writers so requirements can be tailored to the particular facility. JUNEAU, Alaska, May 27, 2014 (ENS) – The Pebble Limited Partnership has sued the U.S. Environmental Protection Agency for taking the first step in a public process that may lead to advance protections for Bristol Bay, which hosts the world’s largest runs of salmon. The EPA’s advance protections would prevent the waste from a massive proposed gold, copper and molybdenum open pit mine in the Bristol Bay watershed from damaging the world’s largest sockeye salmon fishery and the local communities that depend on the Bay’s abundant fish. Wholly owned by the Vancouver, British Columbia based company Northern Dynasty Minerals, Ltd., the Pebble Limited Partnership Wednesday filed suit in U.S. District Court for Alaska seeking an injunction to “stop the EPA’s process to preemptively veto the Pebble Project” under Section 404(c) of the U.S. Clean Water Act (CWA). The Pebble Project is located 200 miles southwest of Anchorage on state land designated for mineral exploration and development. It is situated in a tundra region 1,000 feet above sea-level, 65 miles from Cook Inlet, which flows into Bristol Bay. In its complaint, Pebble Limited Partnership asserts that in the absence of a permit application, EPA’s action exceeds its authority under the CWA and is contrary to the Alaska Statehood Act, the Cook Inlet Exchange legislation, and other federal law. “If EPA ultimately vetoes Pebble before a development plan is proposed or evaluated through the comprehensive federal and state permitting processes, the precedent established will have significant long-term effects on business investment in this state and throughout the country. Litigation is necessary in order to get the Agency’s attention and bring some rational perspective back to the U.S. permitting process. While we would prefer to avoid this lawsuit, we are fully prepared to defend ourselves against the precedent-setting, unlawful actions of this agency,” said Collier. “Our legal action does not in any way seek to diminish EPA’s legitimate role under the CWA, or its right to participate as a regulatory agency within the Clean Water Act permitting process – including a comprehensive review under the National Environmental Policy Act,” he said. The public interest environmental law firm Earthjustice has denounced the lawsuit. SAN FRANCISCO, California, May 27, 2014 (ENS) – The National Marine Fisheries Service has announced emergency actions designed to protect endangered sperm whales from being caught in the California swordfish/thresher shark drift gillnet fishery. The emergency rule, prompted by advocacy by conservation groups, went into effect Thursday and comes 20 days after the drift gillnet fishing season opened, despite a request from the Pacific Fishery Management Council on April 1 to implement the rules by May 1 when the fishery opened. The previous emergency regulations expired on January 31. “These emergency regulations offer some temporary relief to endangered sperm whales, yet the ultimate solution is to rid the West Coast of destructive drift gillnets altogether,” said Oceana California Campaign Director Dr. Geoff Shester. The regulations say that the Fisheries Service will shut down California’s drift gillnet swordfish fishery if a single endangered sperm whale is killed or injured by the destructive nets. The rule requires independent observers on all drift gillnet vessels operating in offshore waters deeper than 6,500 feet (2,000 meters), where sperm whales are most often observed. The conservation measures will be enforced by requiring fishing vessels to carry vessel-monitoring systems that track the real-time locations of all drift gillnet vessels off the U.S. West Coast. The announcement in the federal register can be accessed here. The emergency actions will last through August 5, when the agency has committed to finalize a permanent rule for sperm whale protection. Two endangered sperm whales were observed entangled (one dead and the other seriously injured) in a drift gillnet in October 2010 off Southern California, and the agency estimates that 16 were caught. Fishing for swordfish and thresher sharks with drift gillnets involves setting mile-long nets at dusk that drift freely where fish, sharks, turtles and marine mammals feed or migrate during the night. The fishery entangles and discards more marine life than it keeps, making this fishery among the deadliest in the nation for marine mammals. The Pacific Fishery Management Council, the advisory body to the National Marine Fisheries Service, will meet June 22 to discuss transitioning the drift gillnet fishery to other, more sustainable gear types. The conservation groups are seeking swift and definitive action to establish a date-certain permanent prohibition on drift gillnet fishing gear off the U.S. West Coast as well as a plan to replace drift gillnets with sustainable ways of catching swordfish. SEATTLE, Washington, May 27, 2014 (ENS) – Portland, Oregon is the Most Bikeable large city in the United States, according to a new ranking released by Walk Score Services to mark National Bike Month. The Seattle-based real estate information business builds innovative software to promote walkable and bikeable neighborhoods, public transit, and short commutes. Bike Score is compiled from a data set that includes bike infrastructure, hilly terrain, the number of bikers on streets, destinations and road connectivity, among other factors. Riverside Portland with its dozen bridges edges out hilly San Francisco for the #1 spot, with Denver, home of the beloved B-cycle bike share, coming in a close third. “This trend is leading a growing number of multi-family developers to build bike-friendly housing with secure storage spaces for bicycles and even putting repair shops in the buildings,” writes Herst. The Top 10 list above includes only cities with at least 500,000 residents. But smaller cities can score even higher, particularly university towns. Cambridge, Massachusetts, home of Harvard University, registered a Bike Score of 92; and the university towns of Boulder, Colorado; and Berkeley and Davis, California all scored in the high ’80s. Bike Score is now available for over 100 U.S. cities. Website visitors can type an address into the “Get a Walk Score” field at: http://www.walkscore.com/ to get the Walk Score and Bike Score for that location. Walk Score recently launched the world’s first apartment search by commute time. Walk Score data is available for any address in the United States, Canada, and Australia. The company has ranked the largest 3,000 cities and over 10,000 neighborhoods so house-hunters can find a walkable home or apartment. Analysts and researchers in real estate, urban planning, government, public health, and finance and more than 10,000 websites use Walk Score Services, which shows more than 13 million scores each day.